The Hubble Telescope has revolutionized our understanding of the cosmos but the venerable telescope has been orbiting for nearly a quarter century and is quickly nearing the end of its already-extended service life. That's not a bad thing, mind you, telescope technology has advanced significantly since the Hubble went up in 1990. And by the end of the decade, we'll have completed an all-seeing observatory with ten times the Hubble's resolution and none of its space-based complications. It's called the Giant Magellan Telescope (GMT), and for good reason. 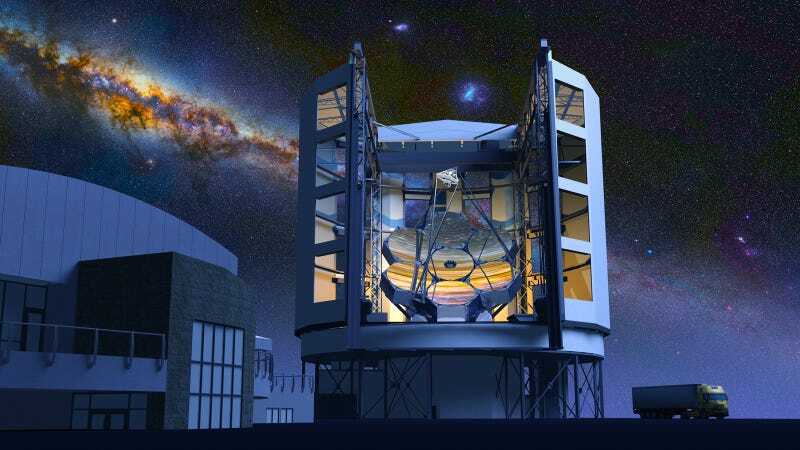 For the last decade or so, the Baade and Clay telescopes have operated at the Las Campanas Observatory in Chile's Atacama desert as part of the Magellan Project, a collaborative effort by the Carnegie Institution, University of Arizona, Harvard University, University of Michigan, and Massachusetts Institute of Technology. At 6.5 meters apiece, measured by their apertures, these optical/near IR telescopes are among the 16 largest telescopes on Earth, the biggest of which measures 10.4 meters. The GMT will have an aperture of 24.5 meters—that's 80 feet across, 2.5 times that of the largest ground-based optical on the planet, nearly four times bigger than the current Magellen project, with a resolution 10 times that of the Hubble. All without having to be launched into orbit. Since pouring and shaping an 80-foot wide piece of borosilicate glass is still beyond our most advanced fabrication techniques, the GMT employs a segmented mirror array comprised of six offset 8.4 meter mirrors working in concert. These mirrors are precisely shaped and uncannily flat. Produced at the Steward Observatory Mirror Lab (SOML) in Tucson, Arizona, each mirror starts out as a honeycomb mold. This mold is "spin cast" in a giant rotating oven, using cintrifugal force to spread the glass into a hollow disc much the same way pizza crusts are made. Not only does this cut down on the massive weight of each mirror, it allows them to be precisely cooled at night to reduce thermal distortion. Each mirror spends a full year being polished to within a tolerance of a few wavelengths—roughly a millionth of an inch. For perspective, if each mirror were the size of America, Mount McKinley would be barely an inch tall. As with most optical telescopes, incoming light reflects off of these primary mirrors, then again off a set of secondary mirrors, and into the telescope's CCD imaging apparatus. What most optical telescopes don't have, however, is adaptive optics. This revolutionary image stabilization technique employs laser guide stars to act as reference points. By measuring the amount of atmospheric distortion these lasers run into and deforming the secondary mirrors accordingly, this system can image more of the night sky, more clearly, and with far less distortion than conventional ground-based telescopes. It “will allow us to look at giant black holes almost anywhere in the cosmos,” project director Patrick McCarthy, told Motherboard. It will study galaxy formation, hunt for dark matter and clues about the earliest states of the universe. Not only that, researchers hope that the GMT's ultra-res images may find both undiscovered Earth-sized planets and evidence of life on them as well. It's a one-stop alien spotting shop.